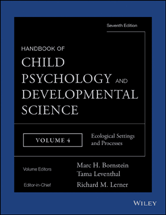 The Handbook of Child Psychology and Developmental Science, a four-volume reference, is the field-defining work to which all others are compared. First published in 1946, and now in its Seventh Edition, the Handbook has long been considered the definitive guide to the field of developmental science. Where Do Children and Adolescents in the United States Work? Levels of Influence: Low for Cultural Contexts?